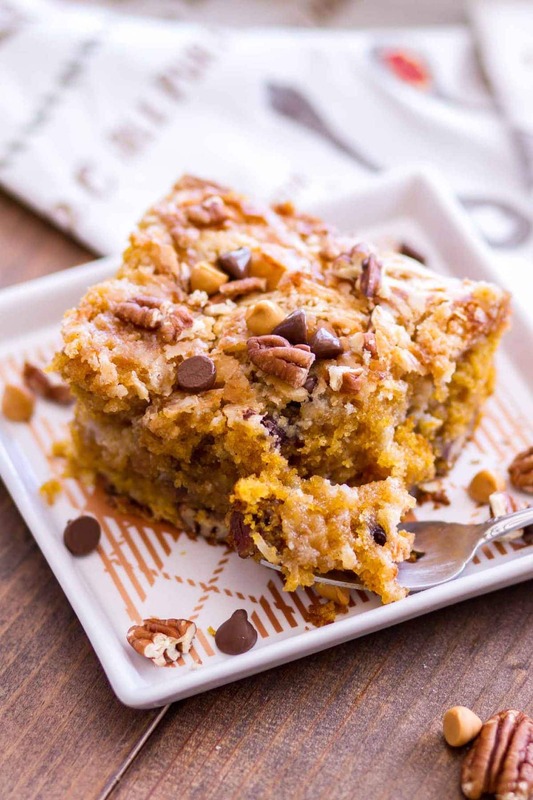 This Easy Earthquake Pumpkin Cake Recipe is one of the best fall dessert recipes! Doctored up cake mix is swirled with a cream cheese filling, making a rich, gooey earthquake cake that’s 100% over-the-top and downright delicious. Earthquake Cake. 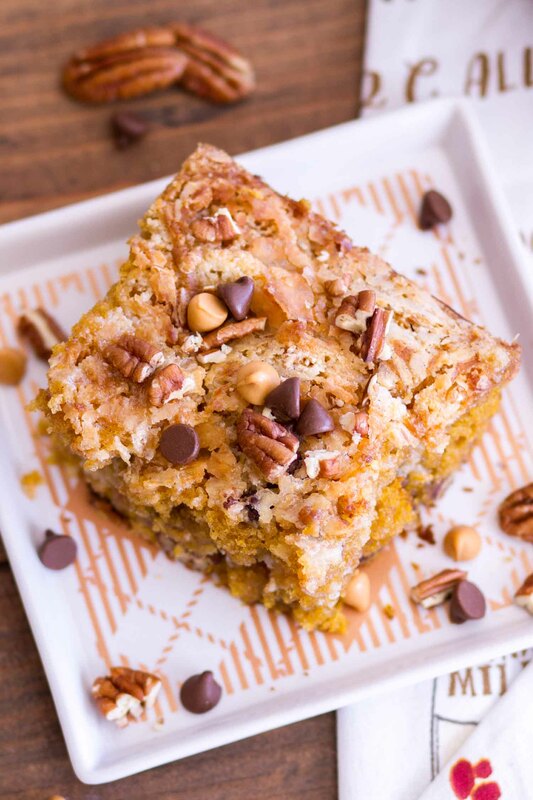 I’m adding pumpkin to mine to make it the perfect fall dessert! There’s nothing better than a pumpkin cake recipe for the holidays is there? If you’re familiar with what earthquake cake is, you know what I’m talking about when I say it’s practically irresistible. 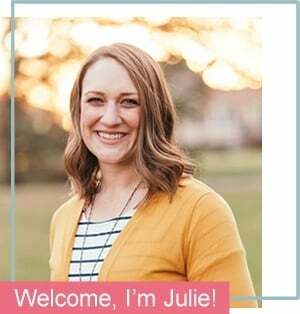 If you’re not familiar with it, let me be the first to tell you about this life changing, rich, gooey and utterly ridiculously delicious dessert. It’s almost like cake meets brownie meets pudding and it’s weird and wonderful all at once. Then you add pumpkin and spice to the mix and it’s pretty much the fall dessert of all of my hopes and dreams (and hopefully yours as well). 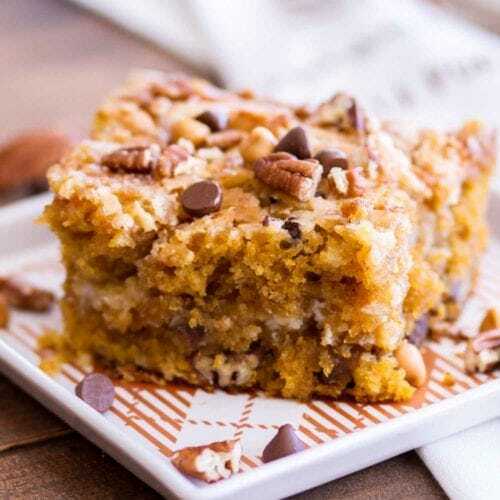 This Pumpkin Earthquake Cake is one of those desserts where it’s perfectly understandable if you eat it straight out of the dish. Absolutely no judgement on my end, especially since I’ve definitely done that before. This Cream Cheese Glazed Pumpkin Bundt Cake? It happened. 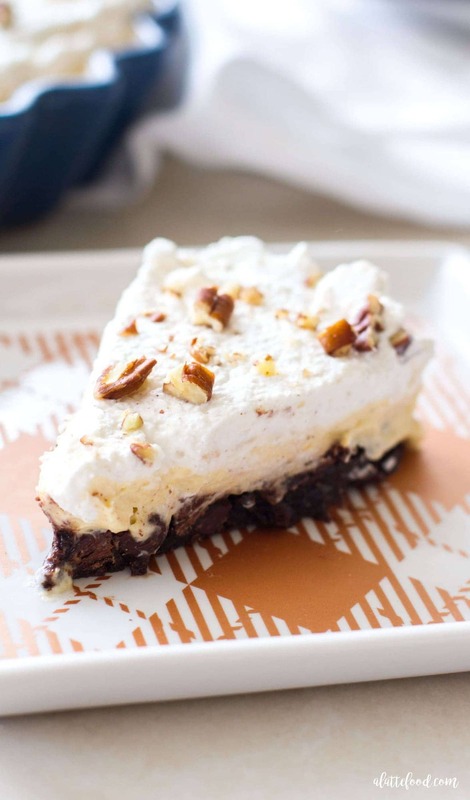 This Brownie Bottom Pumpkin Cream Pie? You betcha. 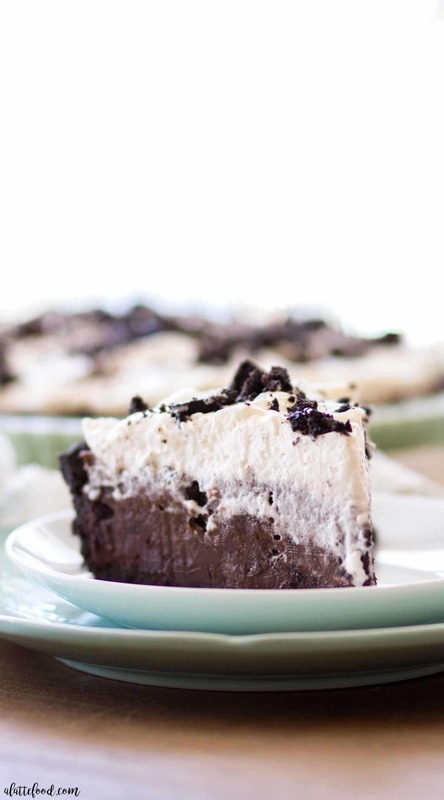 And this Oreo Chocolate Cream Pie? I couldn’t help myself. Were they low moments? Probably. Were they also great moments? Oh yeah. Ohhh yeahhhh. Basically, if you haven’t quite picked up what I’ve been putting down, this Pumpkin Earthquake Cake is amazing. 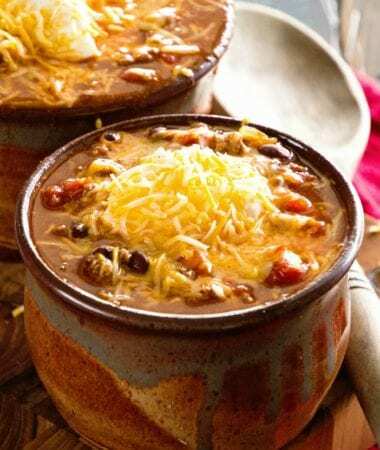 It’s incredibly easy, it feeds a crowd, and it’s full of pumpkin spice and everything nice. It’s a little something I like to call the trifecta of fall desserts. 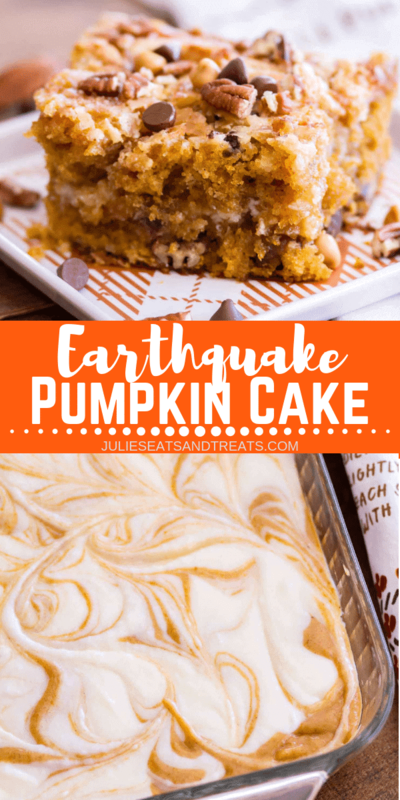 So, let’s talk about earthquake cake for a hot second here. Namely, what is an Earthquake Cake? Earthquake Cake gets it’s name because the cream cheese filling sinks a bit after the cake bakes, making the cake look a little cracked and uneven, as if it’s been through an earthquake. This Pumpkin Cake Recipe is based off a recipe clipped from a newspaper years ago. 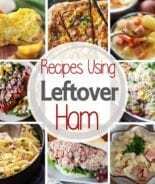 The original recipe uses german chocolate cake mix, but I used white cake mix. You could easily use spiced cake mix or yellow cake mix as well. First things first, do not follow the instructions on the back of the cake mix. 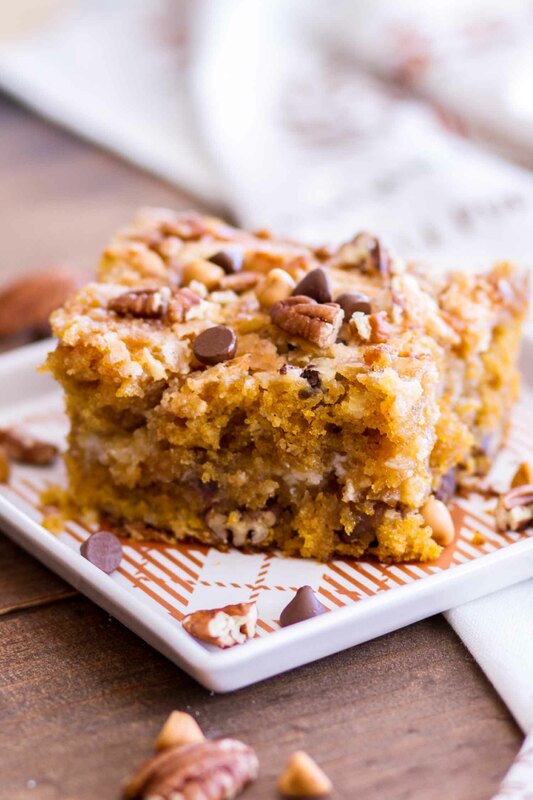 Due to some of the additional ingredients in this Pumpkin Earthquake Cake, we use different measurements for some of the ingredients on the back of the box. For the cream cheese filling, you can either whisk the mixture together by hand, use a standing mixer, or use a hand mixer. 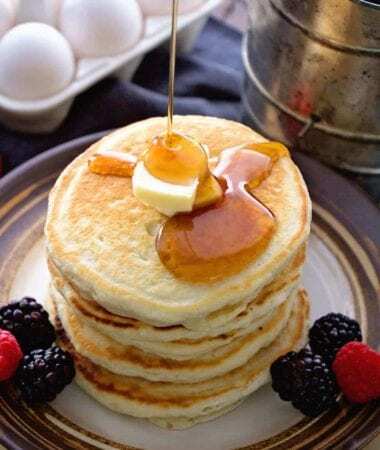 I like to dollop the cream cheese mixture over the top of the cake and then swirl the layers together, but you can also pour the the cream cheese mixture right on top and then swirl it together. Bake this for 35-36 minutes. While you want the top of the cake to be set, it’s all right if the cake jiggles slightly in the center when the pan is gently tapped. The cake will be gooey and rich and perfect. 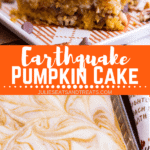 Watch me make this Earthquake Pumpkin Cake Recipe below! 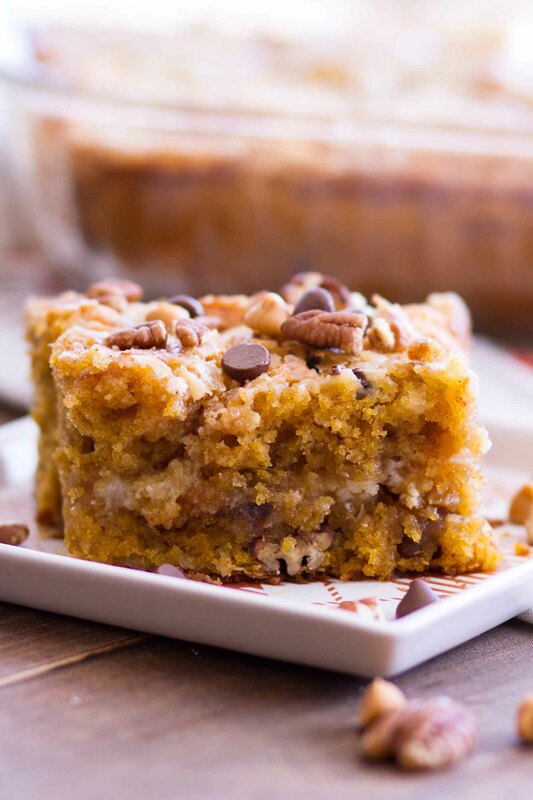 This Easy Pumpkin Earthquake Cake Recipe is one of the best fall dessert recipes! 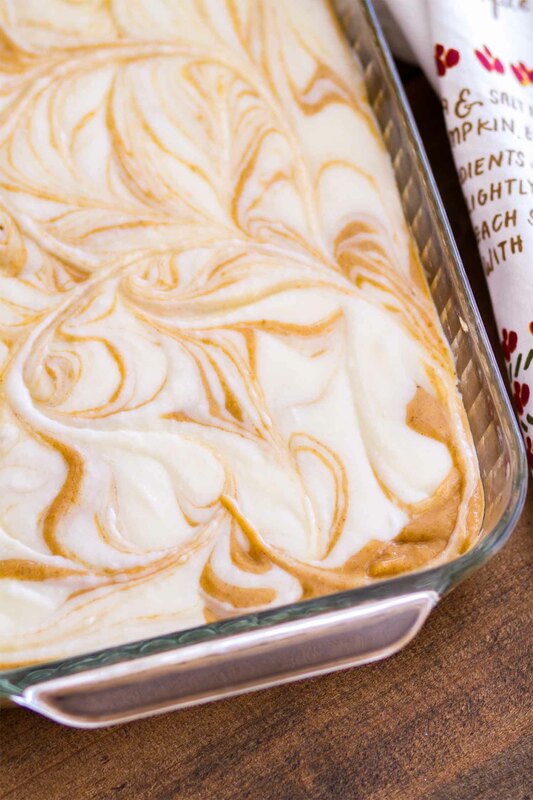 Doctored up cake mix is swirled with a cream cheese filling, making a rich, gooey pumpkin cake that’s 100% over-the-top and downright delicious. Preheat oven to 350 degrees and grease a 9x13 baking pan. 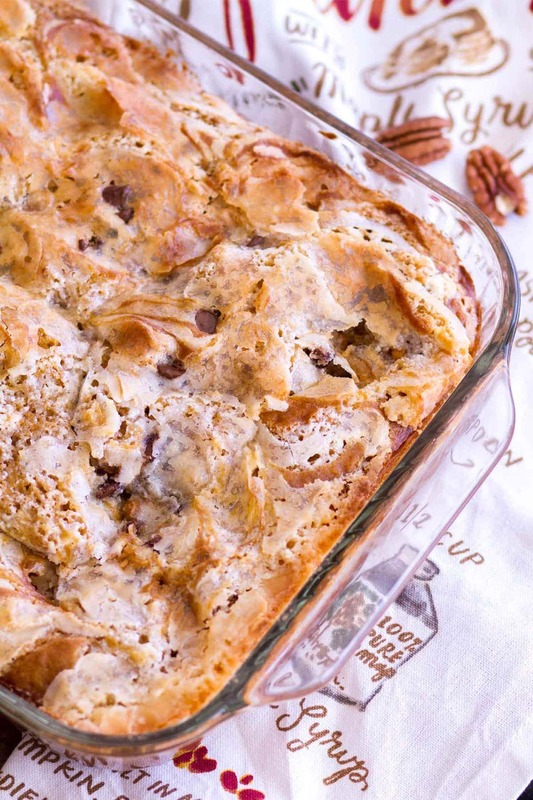 Sprinkle coconut and pecans over the bottom of the baking pan. Set aside. In a bowl, mix cake mix, vegetable oil, water, pumpkin brown sugar, pumpkin pie spice, cinnamon, all spice, vanilla extract and eggs together. Mix until well combined. Pour batter over the coconut and pecans. In a separate bowl, whisk (by hand or with a mixer) cream cheese, melted butter, and powdered sugar together. Once combined, dollop spoonfuls of the mixture on top of the pumpkin cake batter. Using a knife or toothpick, swirl the cream cheese and pumpkin cake together. 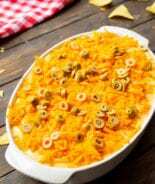 Sprinkle chocolate chips and butterscotch chips on top and swirl the chips in with the cake. Bake for 40-45 minutes. The cake should be set on top but the center should still jiggle lightly when the cake pan is gently tapped. Allow to cool before serving. Due to the cream cheese in the cake, I prefer to eat this cake cold, but it can be eaten warm or at room temperature as well. My family loved this cake! It was super easy to make and it’s a great start for fall baking! So glad they enjoyed it! 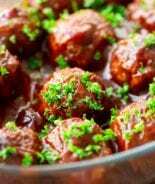 What an easy recipe that’s perfect for fall! This is a keeper for sure! That cake is absolutely mouthwatering! 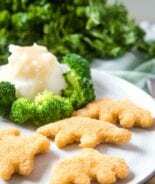 Making this soon! I’ll be over for a piece! This looks incredible! 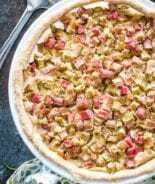 It’s a must-try for this fall! Pinning! 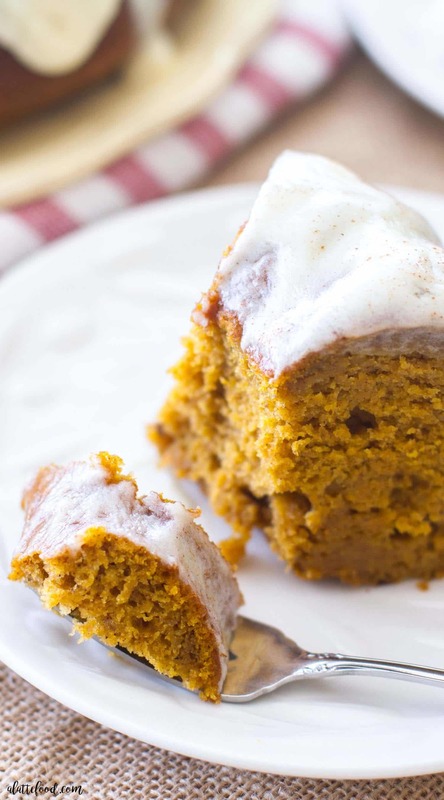 Such a great pumpkin dessert! Cake meets Brownie meets Pudding?!?!? SIGN ME UP because this sounds like the best dessert ever!! It’s like the perfect marriage of all your favorites! OH MY GOSH, this was good! On the menu for Thanksgiving!